Click on the Windows key to open the start menu. Type ‘mmc’ in the search box without quotes and hit enter. A new window will pop up. Go to File> Add/Remove Snap-in.This will open up Add/Remove Snap-in box. Check out for ‘Group Policy Object’ on the left hand side and add it to the right column by clicking on ‘Add’. ‘Select Group Policy’ box will pop up. 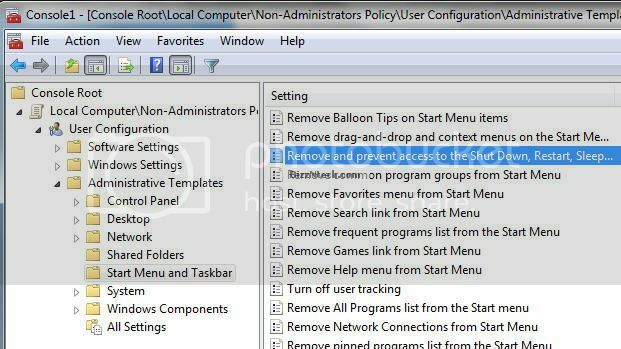 Here you can rename the Group Policy Object if you desire. Now click on browse to allocate this policy to a particular type of profile. For instance; Non-Administrators. If you choose ‘Non-Administrators’, you are selecting custom settings for this type of group. 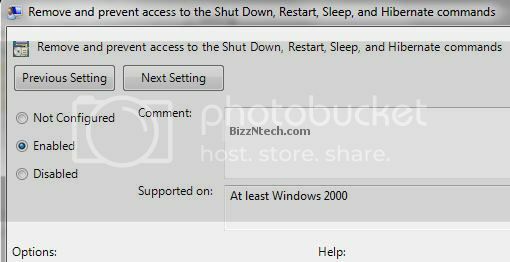 In this case we are going to hide shutdown option from non-administrators. You can select the type of group by clicking on the User tab. Click Ok once done. You’ll be brought back to the console window. On left hand side column navigate to User Configuration> Administrative Templates> Start Menu and Taskbar. On the right hand side look for “Remove and Prevent Access to Shutdown, Hibernate, Restart and Sleep”. Double click on it and select ‘Enabled’. Click on ‘Ok’ to apply changes and exit.